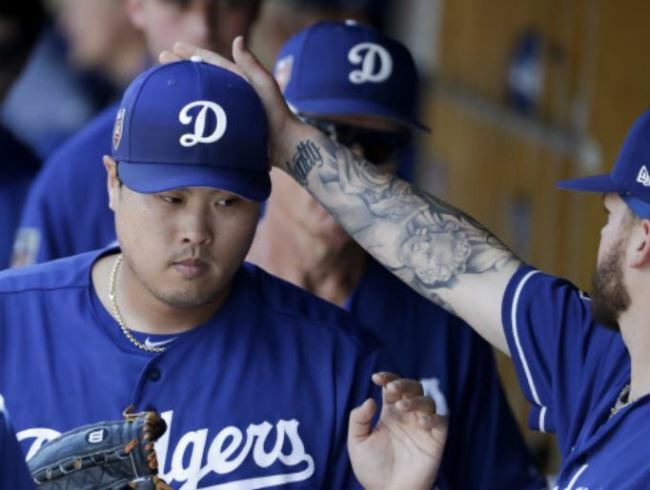 The Los Angeles Dodgers' Ryu Hyun-jin has earned his second preseason victory in his best outing of spring training so far. The South Korean left-hander held the Los Angeles Angels to a run on five hits in five innings at Camelback Ranch in Glendale, Arizona, on Thursday (local time), as the Dodgers prevailed 4-3. He struck out six and walked just one, while lowering his ERA from 14.29 to 8.44. This was Ryu's third start of spring training. He allowed four runs in 2 2/3 innings against the Colorado Rockies on March 11 and gave up five runs in three frames versus the Chicago White Sox six days later. Against the Angels, Ryu threw a spring training-high 74 pitches. Already slotted in as the fifth starter in the Dodgers' regular season rotation, Ryu has been tinkering with his pitches in spring training. He's been throwing more two-seam fastballs and trying to throw curveballs with a tighter spin. Ryu had a clean first inning and struck out former American League MVP Mike Trout on three pitches. The pitcher wiggled out of a bases-loaded jam with two outs in the second by striking out Martin Maldonado on a curve. After retiring Ian Kinsler to begin the third, Ryu gave up back-to-back singles to Trout and Justin Upton. But with the men at the corners, Ryu got Albert Pujols to pop out to second and struck out Zack Cozart looking to end the threat. The Angels got their only run off Ryu in the fourth, thanks to a two-out solo home run by Luis Valbuena. Ryu shook off the homer by striking out Maldonao to end the fourth, and retired Kinsler, Trout and Upton in order in the fifth. The Dodgers scored a run each in the second, third and fifth innings, and Ryu left the mound with the Dodgers leading 3-1. The Angeles cut it to 3-2 in the top of the sixth with Cozart's solo home run, but the Dodgers responded right away with a Cody Bellinger solo shot in the bottom of the sixth. Trout's RBI single got the Angels to within 4-3, but JT Chargois and Josh Fields each threw a perfect eighth and ninth inning to slam the door shut.